I’m not an athletic person. I’m not someone who gets up early to go for a jog or tortures myself with pilates in my spare time. 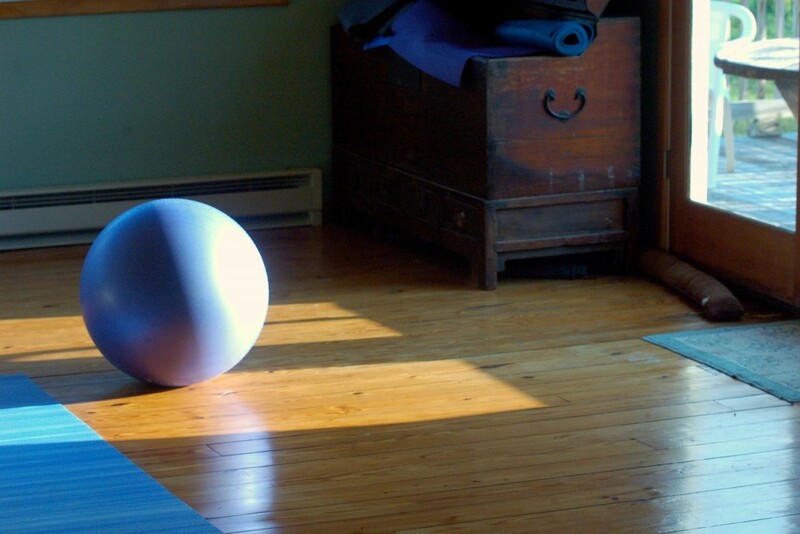 However, lately I’ve heard about the myriad benefits of exercise balls during pregnancy. And since I’m quickly approaching the due date of my second child, I figured I should really splash out and get myself one. I have never used an exercise ball in my life. I didn’t quite know what to expect, but I certainly didn’t expect to be inspired to write an article about it. Still, as I bounce away on this seemingly omnipresent orb, I can’t help but draw an analogy between it and novel writing. Getting pumped up isn’t that difficult. Staying pumped up is. Okay, so spending 30 minutes trying to inflate my exercise ball with an itty-bitty hand pump was a bit of a challenge. In fact, for the first 15 minutes, I wasn’t sure any air was getting in at all because its shape didn’t alter in the slightest. And yet, now that the ball is inflated, my biggest challenge is keeping it at a level of firmness. It seems that within a few minutes of sitting on it, I’m sinking closer and closer to the ground. So I pull out the itty-bitty hand pump and start injecting it with more air. Indeed, my arms are sore from repeating this process. Now, you’re probably thinking my exercise ball is defective. You’d probably be right. But that’s not the point. The point is that novel writing is the same. Getting pumped up to write a novel is the easy part–at least by comparison to staying pumped up. Enthusiasm begins to wane as reality sinks in. You’re no longer simply mulling over ideas and characters in your mind; now you actually have to write about them and sustain it for around 300 pages. My suggestion is to find quick and easy ways to reignite your writing passion. When you start to feel deflated, read a book, play some music, go for a walk, watch a movie. Do whatever you can to keep yourself going. Balance is the key to not falling on your backside. Being pregnant and having and extra 20+ pounds on your stomach doesn’t exactly make for good balance when you’re just walking, never mind trying to sit on something round and slippery. It’s taken me a few tries to get the hang of how to distribute my weight effectively across the ball. However, I have a good source of motivation: if I don’t achieve balance, I’ll have a bruised bum to think about (in addition to a big belly). One major key to novel writing is balancing your life. You can’t throw every ounce of your energy into writing and neglect your other responsibilities. When your family or work begin to suffer as a result of your fervour, you’re going to end up falling on your backside and giving up on your novel altogether. Instead, set aside time specifically for writing, and stick to it. Don’t tell yourself you will write all day long whether the kids want to go outside, or you’ve got a big meeting to prepare for, or whatever. Bigger doesn’t necessarily equal better. Once I got it home and did a little research, I discovered the smaller balls are meant for smaller people. I’m not exactly tall, so I probably should have gotten the small or medium sized one. We often equate bigger with better, and sometimes we think the more we write, the better. Sometimes this is true, if you’re talking about productivity. But what about quality? Producing 2 pages of quality writing in a day (pages that you will actually use in your novel) is ultimately more productive than writing 10 pages you’ll have to scrap later on. While it’s important to keep on schedule and get those words down on the page, it’s usually best to remember quality over quantity. Of course, the best result is to have both. Be careful, or it will get stuffed away, never to be seen again. Whatever happened to that Thighmaster, that Ab-roller, that stationary bike or weight set? The road to better health is paved with good intentions and plenty of abandoned exercise equipment. What about that novel? If you aren’t careful to finish what you’ve started, it’ll end up stuffed in a bottom drawer or hoarded away on your hard drive, never to resurface. Once you’ve mentally put it on the shelf, I’m afraid it’s done-for. Each of these factors are controlled by you, so remember you hold the key to keeping your manuscript alive. So, should I buy an exercise ball? Am I saying every novelist should go out and buy an exercise ball so they can be reminded of these writing truths? Of course not. That would be silly. Unless, of course, you’re into fitness. I’m just taking one for the team, here. Suzannah — love this analogy. Leads me to reflect on a similar one I use from time to time: novel writing is the same as exercise in general. There's a right way and a wrong way to do it, and if you do it the wrong way you'll not only most likely fail, you might get hurt. It's all about learning the basics and the latest techniqes instead of making up your own rules. Chance are doing it "your way" is wrong anyhow. It requires and cultivates discipline and consistency. It's all about mind -ocus and strict form, rather than merely style. And, it takes time to show results. Mostly, it's this forumla: effort — informed effort — gets results. Nothing less. You can't do it casually and expect to turn pro at it. Heading for my exercise ball for some crunches. And then, to my manuscript to crunch on it. I like your thoughts on novel writing and exercise. I've definitely hurt myself in the past trying to get fit in the wrong way, so I can see how that would apply to writing as well. The bit about "taking time to show results" is particularly relevant. I hadn't thought of that. Thanks! Good luck with the baby ! This is a great posting, Suzannah!! I really love your point about bigger not meaning that something is better. I'm all about conciseness, and any writing that's longer than it should be will not get read. Thank you for another insightful posting!! Thanks for your continued support here. I do find some books are just too long. The human brain can only absorb so much. Unless the information being presented is relevant and attention-grabbing, it's just wasted space (in my opinion).